In this article we explore specific eligibility and other elements in the current law with respect to the main residence capital gains tax exemption. The articles to follow then focus special provisions that may be applied under certain circumstances to maximize gains on an after tax basis. Generally speaking, you are eligible for the MR exemption if you dispose of a dwelling (including adjacent land of up to two hectares) that was your MR during the entire ownership period. For the purposes of the above, unless a dwelling is accidentally destroyed, the adjacent land / structure needs to be sold with the residence to qualify for the MR exemption. That is, adjacent land sold separately from the dwelling is generally not eligible for the MR exemption. Accordingly, if a taxpayer subdivides land on which the family home is built and subsequently sells the subdivided land (along with any dwelling built on it), the MR exemption cannot apply to the sale of such subdivided land. Depending on the particular facts (eg. if the taxpayer lived in a new dwelling constructed on the subdivided land) a partial exemption may be available on sale. Professional advice is recommended to determine the relevant facts, as the extent to which the exemption applies may turn potentially on one’s unique set of personal circumstances. The definition in the Income Tax Assessment Act 1997 is key here, because the exemption applies if a capital gains tax event happens in relation to a ‘dwelling’ that is occupied as a main residence. If the asset disposed of is not a dwelling pursuant to the Tax Act then the MR exemption cannot apply. A dwelling includes a unit of accommodation that is a building or contained in a building (including land directly underneath) and consist mainly of residential accommodation eg. house, cottage, apartment, unit in retirement village. It can also include caravans, houseboat or other mobile home. a tent would not because it is not a substantial permanent structure. Whilst it is generally accepted that only one dwelling can be a taxpayer’s main residence and qualify for the MR exemption at any one time, the ATO took the view in TD 1999/69 that a dwelling can include other units of accommodation that are used together with the dwelling as one place of residence (eg. a granny flat). The tax determination sets out a number of key factors in determining whether two or more units of accommodation are used together as one residence, including the proximity between the dwelling to the unit(s) of accommodation; whether the occupants sleep, eat and live in both units and the extent to which the daily activities of the occupants in the units are integrated. Therefore, it is in fact possible for one to qualify for the MR exemption on both the original dwelling and the granny flat if these are sold together as a single main residence. It is important to note that not only are you required to physically occupy a dwelling as their MR (ie. a mere intention is not sufficient: Chapman v FCT  AATA 421), you are also required to do so ‘as soon as practicable’ after acquisition in order to qualify for MR exemption for the period from purchase settlement to actually moving in. To be clear, ‘as soon as practicable’ does not mean ‘as soon as convenient’. If you did not move into the dwelling because you were serving a secondment in another city, case law suggests that this is not a reasonable cause for delaying your moving in. Accordingly, only a partial MR exemption would apply, from the time you actually move into the dwelling rather than from settlement. Whilst it is accepted that no single factor alone is conclusive of whether you occupy a dwelling as your MR (ie. this requires the consideration of the complete facts and circumstances), Erdelyi v FCT  AATA 1388 highlights the lengths that the Tax Office could go to in cross-checking facts to determine qualification for the MR exemption. In finding that a newly constructed dwelling was not a couple’s main residence, relevant factors included their failure to use the kitchen stove over a three month period; the absence of refrigeration and clothes washing facilities and perhaps most significantly; their very low electricity usage ($2.30 per week, as compared with the $17 per week average usage for families as recorded by the Australian bureau of Statistics). In a nutshell, if you want to maximise the MR exemption you would need to first establish the dwelling as your main residence by physically moving into it as soon as practicable. 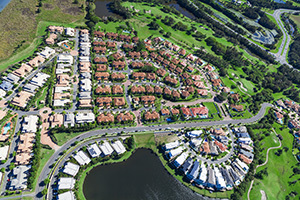 It is also worth noting that in the event of a legal dispute with the ATO regarding the status of a dwelling, the taxpayer has the burden of proving that the dwelling was their main residence.